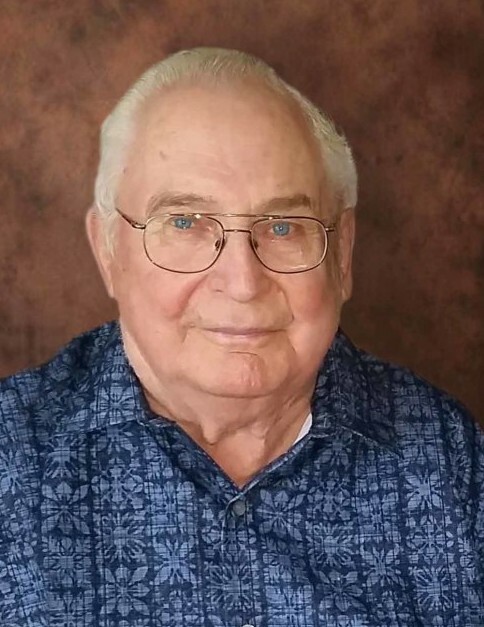 Clive E. Jones, 87, of Oslo, MN, passed away Thursday evening, January 17, 2019 at Valley Eldercare Center in Grand Forks, ND. Clive Ellsworth Jones was born on December 21, 1931, in Oslo,the son on Ebert and Irene (Knutson) Jones. He was raised in Oslo and graduated from Oslo High School in 1949. Clive also attended North Dakota State School of Science in Wahpeton, ND, and Aakers Business College in Grand Forks. He was in the United States Army for two years, where he was stationed at Fort Sill in Lawton, OK. On March 14, 1954, Clive married Jacquelyn Olimb in Oak Park Lutheran Church. They made their home just west of Oslo in Walsh County, ND, where he farmed. Clive also worked at American Crystal Sugar Company in East Grand Forks, MN. They moved into Oslo in 1967. He was very active in community. Clive was a member of Zion Lutheran Church, Elks Club, Shriners of Stephen, MN, Oslo American Legion where he served as Commander, Oslo Lions Club, vice-president of Farmers Elevator in Oslo, secretary of Walshville Township, board member of Valley Memorial Homes, and the Family Motor Coaches Association (FMCA) / Ramblin' NoDaks Chapter. Clive enjoyed NASCAR racing and traveling. When he retired, his “gold watch” was his motor home, in which he and Jacky enjoyed traveling. Left to mourn his passing and celebrate his life are his wife of nearly 65 years, Jacquelyn; children, Craig Jones of Oslo, MN, Michelle (Charles) Dahlstrom of Warrensburg, MO, Pamela (Alan) Jones Borho of Grand Forks, ND, and Rhonda (Eric) Jones Schaefer of East Grand Forks, MN; sister-in-law, Leah (Gary) Hendrickson, eight grandchildren, and four great-grandchildren, with one on the way. He was preceded in death by his parents, Ebert and Irene Jones; sister, Ivadelle; parents-in-law, Harold and Ruth Olimb; and two brothers-in-law, Harold Paul and Roger Olimb. The family wishes to thank the Staff of Valley Eldercare, Grand Forks, ND, for their compassionate and excellent care of Clive. Memorials are preferred, and may be made to Valley Memorial Chaplaincy Fund or the Shriners Hospitals for Children. FUNERAL SERVICE: Monday, January 21, 2019, at 11:00 AM, in Zion Lutheran Church, Oslo, MN. VISITATION: Starting at 9:30 AM until the time of the service on Monday at the church. INTERMENT: 2:30 PM on Monday at Memorial Park South (on 32nd Ave and S. Washington), Grand Forks, ND. MILITARY SERVICE BY: Minnesota National Honor Guard.